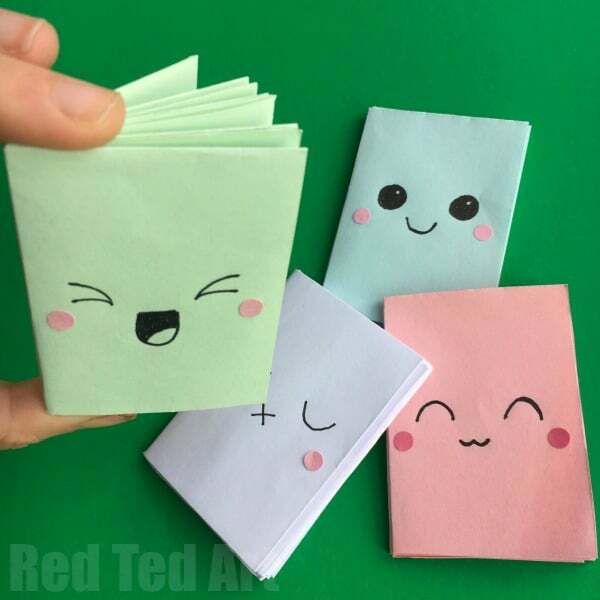 We made this little DIY Mini Notebooks from a sheet of paper quite a few months ago and only now are we FINALLY sharing them here on Red Ted Art. Ooops! You may have spotted them over on our YouTube channel already, but I thought it was about time to share them here, in case you hadn’t. 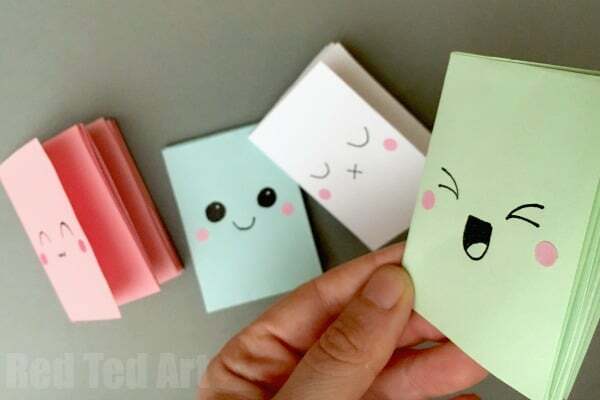 These DIY Notebooks are super duper cute and fun to make – they are based o KIRIGAMI, ie they are not an origami notebook, as there is some cutting involved. But they ARE a bit like magic. 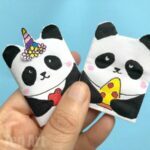 Once you have learn the knack of how to make them, you will want to make them over and over again and decorate them in lots of different ways (e.g. 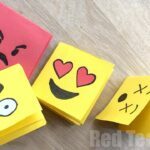 we made a cuet Square Emoji Notebook DIY version already). 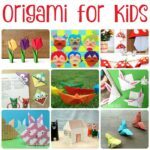 So, if you are in need of craft ideas for kids this summer (especially if it is raining like it is here!!) 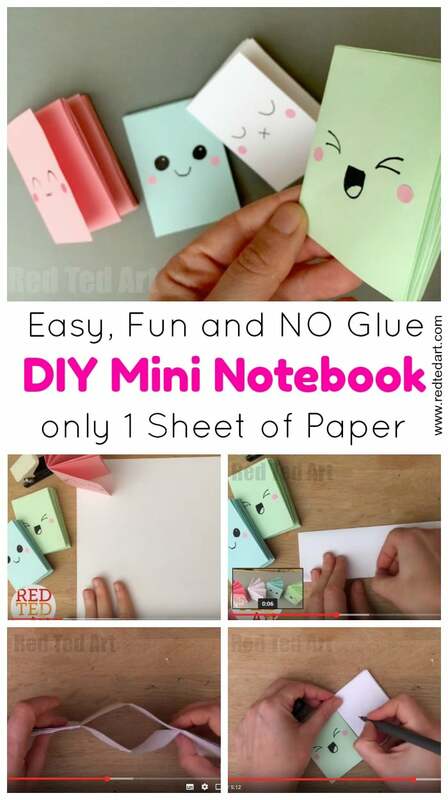 you will love this notebook tutorial, as it is easy, simple, fun and only needs one sheet of paper to make this adorable mini notebook. We have some matching Kawaii Pencil Holders too! 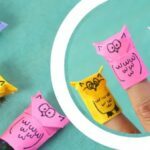 So quick and easy to make! 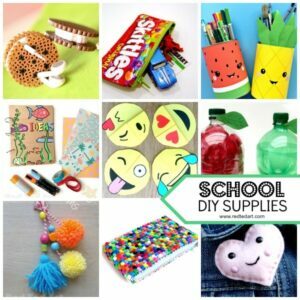 Perfect for School Supplies lovers too! 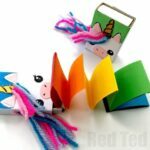 You can use these little min books for school. They make a great diary for summer or even use it as a little sketch book! 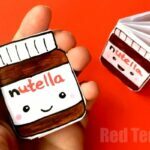 And needless to say these mini notebooks from one sheet of paper, can be decorated in whatever way you wish. 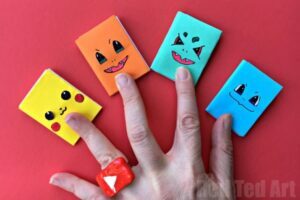 Today we picked cute “Kawaii” faces… but as mentioned we have done some fun Emoji Notebooks, and have turned similar paper notebook version in Pokemon Notebooks before too. Decorate them for Easter, Spring or Valentines – draw flowers, hearts or anything you fancy! Let your imagination run wild. As mentioned each notebook only needs ONE SHEET of paper. Any paper of any dimension swill do, but we used an A4 sheet of paper. You will also need scissors and pens for decorating. Though these one sheet notebooks are “no glue”, we DID use a TINY bit of glue for decorating… but you can of course use pens instead! Ta Daaaaa. yes it is VIDEO time once again. The video really IS worth watching, especially for the curcial step, where you “flip the book” before you fold. This makes the difference of creating many pages vs about 4! 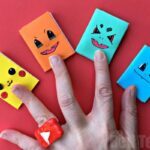 This video shows you step by step of how to make a notebook from a sheet of paper. 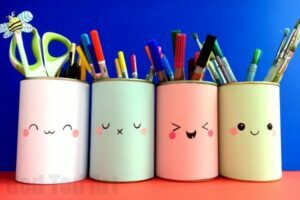 If you love our Kawaii designs.. why not make a set of Kawaii Pen Pots to go with it? You may also like, this TWO TONE mini notebook – choose different colours for you pages and cover and decorate to your heart’s content! 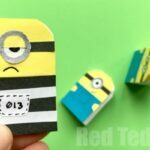 Hope you enjoyed this easy Mini Notebook from a one sheet of paper DIY. Hope you get as hooked on these as we are. They are so fun!!! That is so cute! I made for my son and he loved it. Brilliant! Can’t wait to make little personalized booklets for my Monkeys!